We’re aware the future of Tally Hall is fuzzy. Surely, from the information gathered, we probably won’t see much action from the band for awhile. But that doesn’t mean the 5 guys are retiring their musical ties (pun intended). 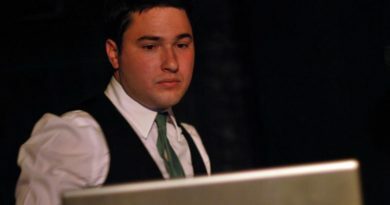 We also know that Andrew Horowitz has been working on a solo project, has played a couple gigs in the NY area, and teased us recently by stating he’s working on a new track and debuting it soon. Andrew will be making a full announcement probably tomorrow, but we’ve got a jump on the news. So here ya go! HITS: Are you releasing your first demo album on cassette only? Horowitz: Yup. I don’t want my music circulated in disposable format and I want to release quickly and make it personal. I like to think my music is intimate. Indeed, this song definitely sounds intimate, not unlike the song “You” on Tally Hall’s recent Good & Evil. We can’t wait to hear more. But it seems like if you already threw away your old tape deck, you might wanna go scoping out those garage sales around town soon if you want to hear them! aweh. i totally want this cassette. i actually still listen to all my cassettes, haha–so i am prepared for this! i wonder where mayhaps i could purchase this once it’s out? I believe the link to buy it on the BandCamp site is how to get it.